The first hotel I stayed in in Bangkok was Banyan Tree. 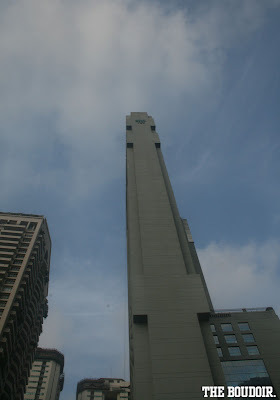 Its located in the quite financial district right next to the other hotel I later stayed in, The Sukhothai. The hotel opened in 2002, I think its my least favorite Banyan Tree branch, but its still good. The service was excellent, so excellent that when we arrived our deluxe room was upgraded to a suite, whatever the reason was, we were more than happy to get it. The Banyan Tree Spa, which I ofcourse had to try, was just perfect, it is after all the best spa brand in the world. 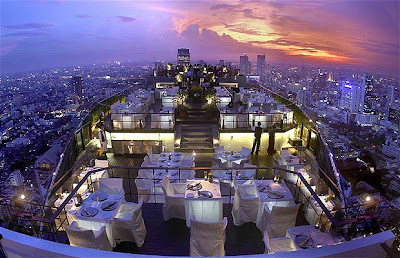 Anyone travelling to Bangkok just has to try their high rooftop grill restaurant, VERTIGO, situated on the 61th floor. They serve the best steak you can ever have. Really expensive but worth it because of the gorgeous night city views, plus you get a complimentary picture while seated. The hotel features other great restaurants like Banyan Tree's signature Thai Saffron restaurant, which is also excellent.